The night before the election I came across something strangely familiar in my Instagram feed. 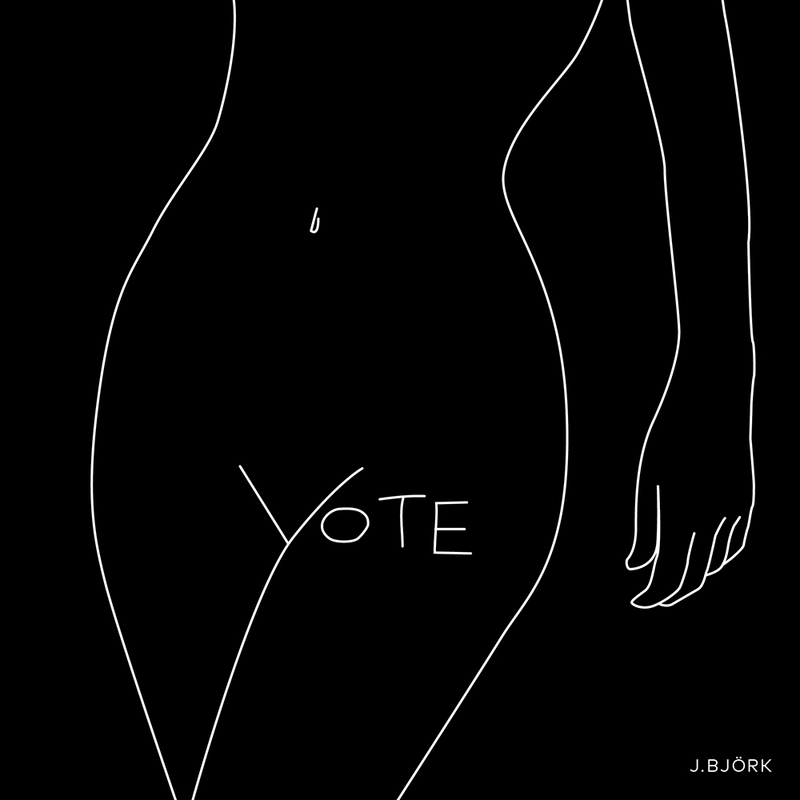 I did a double-take and soon recognized it as an illustration I had created back in 2008, a line drawing of a woman’s body with the word “VOTE” written in a strategic place. It had been posted by someone I don’t really know, and as I followed the trail of the image I found tons of other people had posted it as well. I started hearing from friends that they had seen it on social media for weeks, and also in store windows, on campaign rally signs, posters, etc. It seemed my artwork had gone viral, and I was the last to find out. It’s a strange thing to see your work take on a life of its own in this way. And kind of upsetting to not be credited as its creator. A few of my friends started policing it, posting credits everywhere they could find it. After a while, a wonderful thing started happening. Strangers joined in, posting comments crediting the work to me as well. Social media is a strange and magnificent thing. I posted cleaned up versions of the other two as well, and although they caught some traction it was nothing like the first — there was just something about that one that seems to have perfectly captured the zeitgeist. As always on the Internet, people reacted. Most responded positively, but there were some detractors. The most common criticism was that the artwork was sexist and insinuated that women should vote with their lady parts, not their brains. 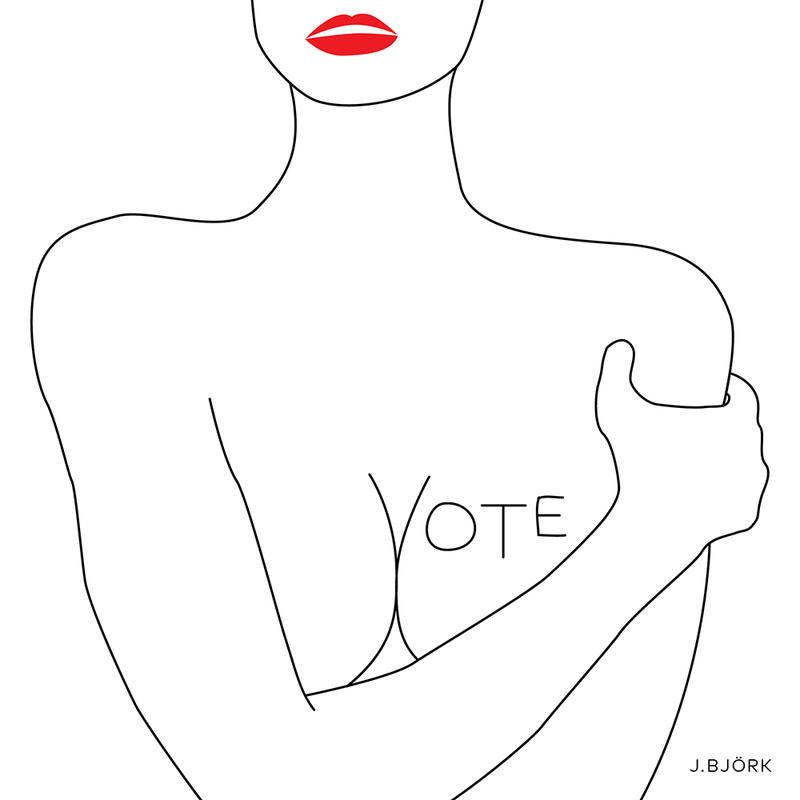 This was, of course, never the intended meaning — it was a playful take on the V-shape of our lady parts, combined with a message of voter empowerment. Sometimes the Internet just needs to chill. A few people tried to take credit for the work, or claimed that they had “drawn it first.” Although I do, as most designers, often (consciously or unconsciously) take inspiration from things I have seen, I assure you that this illustration — and the idea behind it — are entirely mine. And, as previously mentioned, they were created in 2008. There were also quite a few interpretations, and one person even embroidered it. Refinery29 actually contacted me to ask if they could repost the illustration (which is always nice), and if I could make it in blue for them (because Hillary). The post’s discussion thread is pretty interesting. It’s funny how a few lines on paper (or screen) can stir up such powerful emotions. This story does, I believe, illustrate why design is so important. Those few simple, crudely drawn lines were able to make people feel something, and want to share that feeling with their friends and followers. Even though she didn’t win, I’m proud that my work was able to inspire the movement and resonate with so many people out there. We’re still with her. Her has just grown to encompass all womankind, and maybe that’s not such a bad thing in the end. This illustration took 8 years to catch on — sometimes things take time. Right now, it may not be clear to us why things turned out the way they did on November 8, but in time we may learn to see it through a different lens. We have to just keep calm and carry on doing what we can to make a difference. 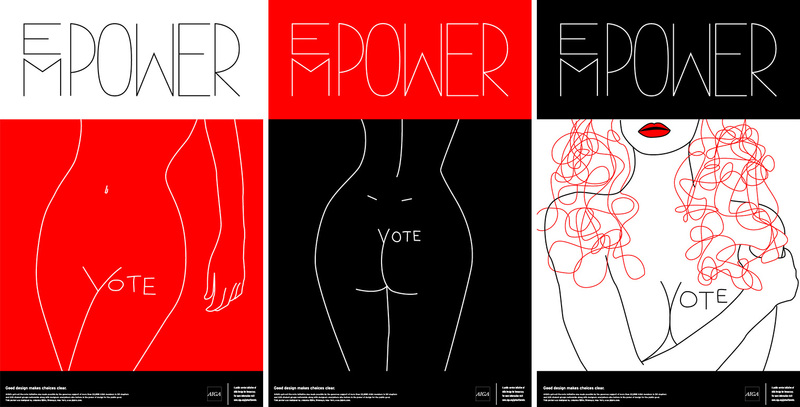 Posters and prints of all three illustrations are available here. Mr. Larkin x J.Björk T-shirt collaboration is available here. All proceeds are donated to When We All Vote or Emily’s List. 2018 UPDATE: This artwork series is once again spreading far and wide on social media. In the wake of #metoo and all the crap we’ve been exposed to since the 2016 election, it feels even more relevant than ever. In the midst of this political shitstorm, it does give me some comfort that my work is able to inspire and perhaps in some small way contribute to change. It’s OK to repost on social media, but please tag and credit @jbjork and/or link to jbjork.com. Unauthorized reproductions are prohibited (especially to sell products for profit — not cool). Most importantly, get out there and VOTE! It’s awesome work! So simple and powerful. Congratulations. You desevre all the attention you get!